This shipment complaint letter can be used if an ordered product is never delivered, or is too late for a deadline. On Nov. 5, 2009, I bought three CozyBlankets for my family by calling the 800 number advertised on television. I paid via my credit card, which was immediately charged. However, it has been six weeks and we have yet to receive the CozyBlankets. They were intended for Christmas gifts, and I am extremely disappointed that they did not arrived during the six-week period promised in your ads. Because CozyBlankets are at the top of my teens' wishlists, I was forced to purchase them locally to ensure I would have them in-hand by Christmas. 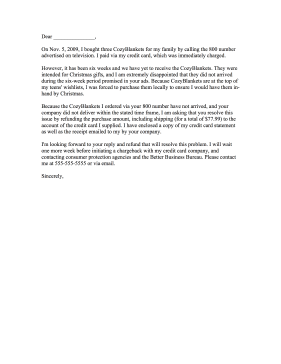 Because the CozyBlankets I ordered via your 800 number have not arrived, and your company did not deliver within the stated time frame, I am asking that you resolve this issue by refunding the purchase amount, including shipping (for a total of $77.99) to the account of the credit card I supplied. I have enclosed a copy of my credit card statement as well as the receipt emailed to my by your company. I'm looking forward to your reply and refund that will resolve this problem. I will wait one more week before initiating a chargeback with my credit card company, and contacting consumer protection agencies and the Better Business Bureau. Please contact me at 555-555-5555 or via email.